The Geissele 2 Stage Enhanced Trigger (B-G2S-E) provides superior control and helps accuracy while maintaining the robustness and reliability that Geissele triggers are known for. The B-G2S-E gives a smooth, light 1st stage take up of 2.3lbs and a crisp, candy-cane-like 2nd stage break of 1.2lbs. The B-G2S-E is ideal for use in precision Squad Designated Marksman type rifles where weapon accuracy and reliability are critical. The Geissele Rapid Fire Trigger (B-GRF) was developed to give semiautomatic-only rifles a glass-smooth trigger pull very similar to the Geissele Super Select Fire (SSF) trigger designed for the U.S. Special Operations Community . The B-GRF is a fast-shooting, smooth trigger ideal for 3 Gun competition and recreational shooting alike. It pulls like a single-stage, but resets like a two-stage. Two trigger springs are included so the B-GRF can be set up with a pull of either 4 lbs or 3.2 lbs. Does NOT convert semiautomatic rifles to automatic. 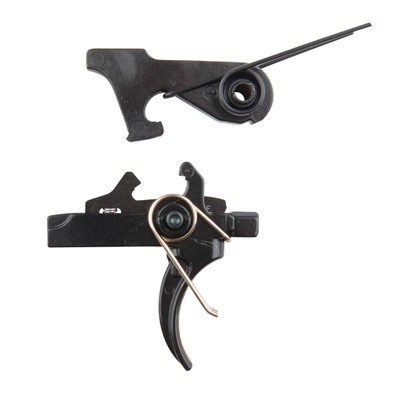 Note: The B-GRF trigger has a very short, light pull and reset. It is not recommended for bench rest shooting or shooting small groups. It is designed for CQB-style rapid target engagement and quick follow up shots. SPECS: Steel, black finish. Fits semi automatic AR-15/M16 receivers with .154" diameter hammer and trigger pin holes. May be installed on AR-style .308 rifles that accept AR-15 triggers. Kit includes trigger and hammer assemblies, springs, hammer pin, tube of grease and installation instructions. Black spring is for 3.2lb pull.Gold and Silver colored are for 4lb pull.